How you parent directly impacts who your children are and who they will become. No one is naturally born a good parent. It takes hard work, determination, and passionate intention to raise our kids right. In the end, we can either parent on purpose&... or idly sit back and allow everything else in the world to shape our children into the men and women they will become. 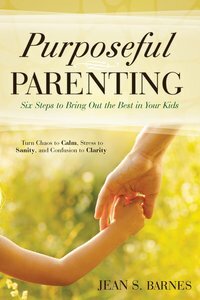 "You can be the parent you've always wanted to be-the parent God wants and your kids need, the parent with a purpose. Your life at home with your kids can be calmer, clearer, healthier, and happier today, starting right now."